Wednesday November 8 1911 We got up early. I was ready to go at 7.15 oclock. Will took me down to The Coralville station. A pleasant ride to Chicago where Ida met me at 2.30. The rest of the day spent pleasantly with them at their home 7552 Gates Ave Thursday November 9 1911 We all went over to La Grange for a visit with [Lorie?] [Bremer?]. It took 4 hours to make the trip which was to me very interesting. We were tired and went to bed early. Friday November 10 1911 Ida & I went up to John O. Neils on 55th St where I got us a nice traveling bag. Met his wife there. Ida went home from The Jackson Park Station and I on to [Engleward?] where I took the train at 10.44 for South Bend I found Winnie all right. We spent the afternoon in looking over that City & [Mishonoka?]. Called on Lorna & family and went to a play in the evening. Weather pleasant. 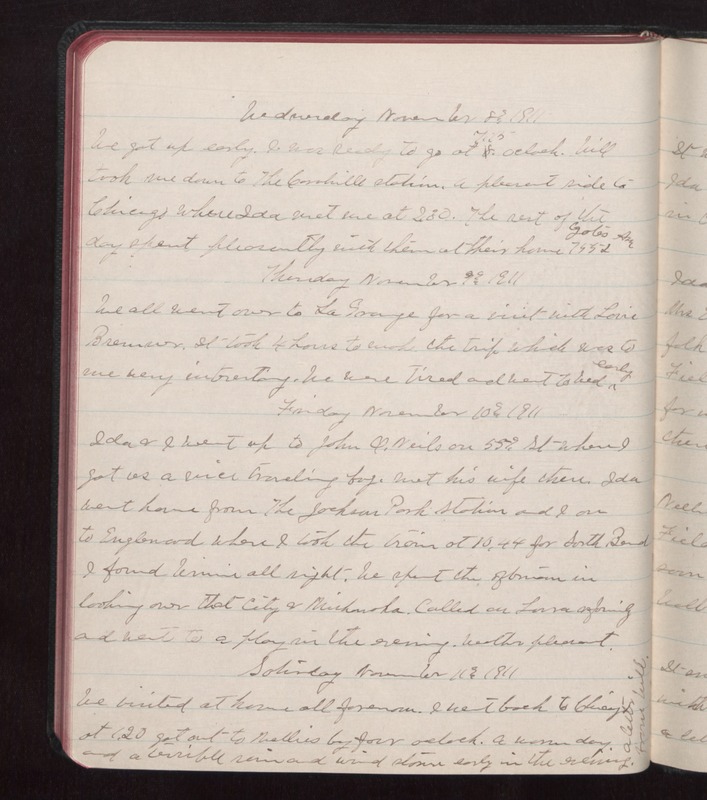 Saturday November 11 1911 We visited at home all forenoon. I went back to Chicago at 1.20 got out to Nellies by four oclock. A warm day and a terrible rain and wind storm early in the evening. A letter from Will.